The Brat was nine years old the first time she rode over the covered bridge that crossed the distance between Lost and Found. Nine-year-old Victoria “Vic” McQueen’s new bicycle brings with it an uncanny new ability: when she rides it across the condemned structure that is the Shorter Way bridge it always takes her somewhere different. Her destination is driven by her desire to find something lost. Looking for an explanation, she finds herself in Here, Iowa where she first hears about Charlie Manx. Manx shares Vic’s ability to travel; his vehicle a 1938 Rolls-Royce Wraith with a vanity plate that reads NOS4R2, his ultimate destination Christmasland, a wondrous place where it is Christmas all year round, and where only children can go. Twenty-five years later, a Vic McQueen who has lived a hard life as the result of her gift finds herself searching for Charlie Manx once more. This time the stakes are much higher, because this time Vic’s own son is a passenger in that 1938 Wraith. Joe Hill’s third novel is undoubtedly his most ambitious to date. Much broader in scale that both Heart-Shaped Box and Horns, the novel follows Vic McQueen from childhood through her early teenage years and reconnects with her in the present day, a woman scarred by the experiences of her childhood, most of which have been glossed over in the retelling to the point where she has convinced herself that the stories are reality and the magic bike and the bridge that leads to anywhere merely a figment of her imagination. Despite her strange gift, and her father’s unflattering pet name – The Brat – it is easy for the reader to identify with Vic: as we follow her growth from childhood to adulthood, Hill ensures that every twist and turn of her life is not only believable, but also inevitable, so that we can’t help but root for her, and hope that, for Vic at least, there is a happy ending. On the other side of the coin is Charlie Manx, a vile conscienceless creature whose sole purpose in life is to feed the insatiable hunger of Christmasland by bringing abducted children to live within its otherworldly boundaries. Manx is a vision straight from the nightmares of parents everywhere and Hill takes him to the bounds of caricature without actually overstepping the mark. What we, the reader, feels goes beyond dislike for the man; Manx instils in us a deep-seated sense of fear, and sends a chill down the spine of even the most hardened of horror readers. Hearing him say her son’s name was worse than having Manx’s hand on her wrist or blood on her feet[…]. Hearing this man, convicted murderer and child molester, speak of her son made her dizzy, genuinely dizzy, as if she were in a glass elevator, rushing quickly into the sky, the world dropping away beneath her. 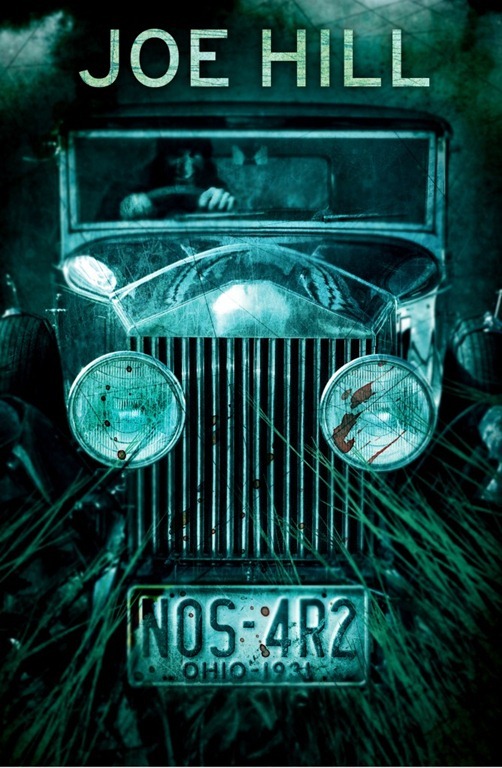 The title of the book is drawn from the vanity plate on Manx’s Rolls-Royce (interestingly, the original American title of NOS4A2 makes more sense to me, but that’s probably down to the idiosyncrasies of the Northern Irish accent) and, when pronounced correctly, provides the perfect description for this insane man. Around these two central characters we find a whole host of players in supporting roles: Vic’s parents whose separation seems inevitable to everyone but nine-year-old Vic; Lou, the young man she will eventually marry; the creepy and decidedly underused Gasmask Man; and Maggie, the stammering librarian of Here, Iowa who has found a unique use for Scrabble tiles. There are plenty more, but these are shining examples, ordinary people in extraordinary situations who never feel less than three-dimensional. It seems churlish to review Joe Hill’s novel and compare it to the works of his father, but Stephen King tends to form the benchmark against which many people (myself included) compare new horror fiction. NOS4R2 is the first of Hill’s novels where the similarity shines through. Much of the novel feels like early King; I was most often put in mind of Christine, but I can’t quite put my finger on why. The novel also contains numerous references to King’s various worlds and works, most noticeably in the form of a mention or two of Mid-World. His decision to embrace the work of King so obviously seems surprising, given his initial route to publication. Which is not to say that Joe Hill is a tired old re-tread (or the second coming, depending on your point of view) of Stephen King. As he has already demonstrated is his previous works, and continues to do so with NOS4R2, he is a fresh and exciting voice in a sometimes weary and unoriginal genre. Little stylistic tics (one chapter runs into the next by including the next chapter’s title – often a place name – in the final sentence of the current one), wonderfully-wrought characters, and a knack for the descriptive (“Vic smelled the vast vault filled with books before she saw it, because her eyes required time to adjust to the cavernous dark. She breathed deeply of the scent of decaying fiction, disintegrating history, and forgotten verse, and observed for the first time that a room full of books smelled like dessert: a sweet snack made of figs, vanilla, glue, and cleverness.”) combine to produce a novel that is as beautifully-written as it is terrifying. Joe Hill has been on this reader’s must-read list since discovering his short story collection, 20th Century Ghosts. His third novel, NOS4R2, is a genuinely frightening experience; Hill knows which buttons to press to get the reaction he wants, and takes great delight in their pressing. It is, for me, his best novel yet, the perfect combination of magical coming-of-age story and balls-to-the-wall horror-fest. You won’t look at Rolls-Royce in quite the same way again, and Charlie Manx is likely to haunt your dreams – especially if you have children of your own – for a very long time. Do yourself a favour and don’t miss it.